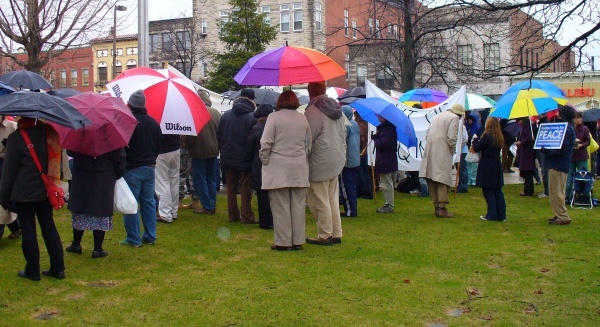 A large number of anti-war activists gathered on the Monroe County Courthouse square yesterday to protest the five year anniversary of our invasion of Iraq. 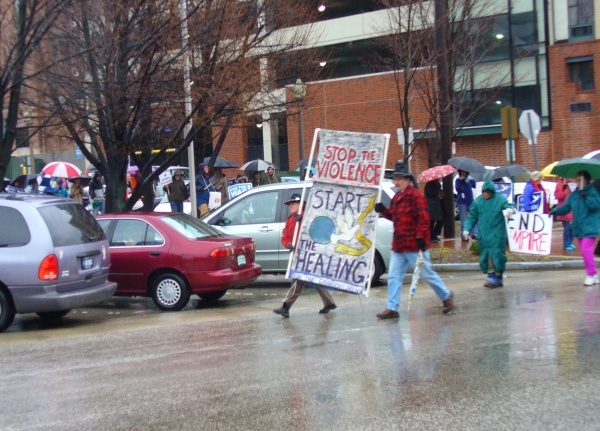 Bloomington anti-war activists started protesting the war before it began, convincing the Bloomington City Council to pass a resolution against the war. A small group of anti-war activists met with Senator Richard Lugar to discuss the march to war and their concerns about it. Speaker David Keppel took issue with a speech made by Indiana's junior Senator, Evan Bayh, in the months before the war. Bayh suggested he had classified information about Iraq, but Keppel said that when the classified information was revealed it actually weakened the case for war. Keppel also criticized Bayh's statement that "the best defense is a good offense", saying that we prosecuted the Nazis at Nuremberg for that doctrine. That statement is a bit hyperbolic, though, because the Nazis were guilty of a lot more than imperialism. 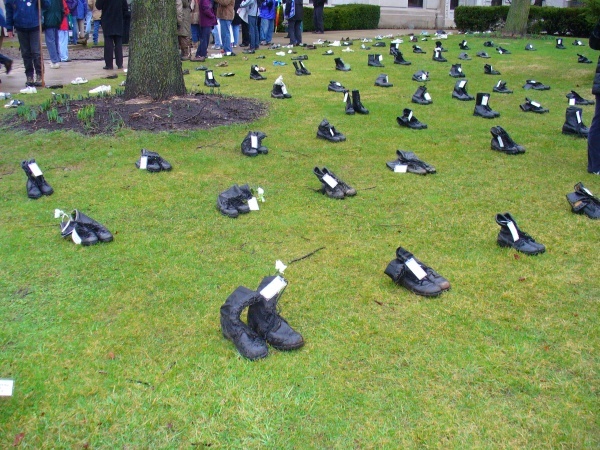 Keppel said it's impossible to know how many children have been killed in this war, but nearly 4,000 American soldiers have died, 150,000 Iraqis have died and 4 million Iraqis have been displaced. 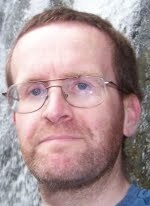 While the 150,000 figure is disputed (iraqbodycount.org estimates about 90,000 while The Lancet places it far higher) there's no question that the people of Iraq have suffered during the occupation and insurgency. Keppel criticized both John McCain and Hillary Clinton, who voted to authorize the use of force. Keppel criticized both Clinton and McCain for not setting a timetable for withdrawal from Iraq. Keppel also criticized Congressman Baron Hill, who voted to authorize the war in 2002. While Hill has changed his position on the war, Keppel said, he has chosen to fund the war in the name of supporting the troops when he is forced to choose by President Bush. At least one of Hill's opponents, Libertarian candidate Eric Schansberg, was at the anti-war rally. I believe Gretchen Clearwater, Hill's opponent in the Democrat Party primary, attended as well. Keppel called for Congress to cut funding for the war, only approving money to withdraw the troops and provide humanitarian relief. He urged the crowd to insist Congress pass a resolution barring military action against Iran without prior Congressional approval. 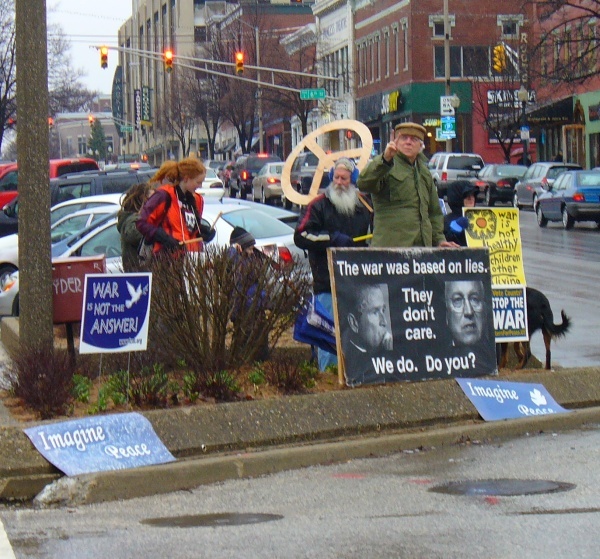 Both of these, especially the first demand, received roaring approval from the anti-war activists who braved the ran and near-freezing temperatures to show disapproval of the war. So what is my opinion? I supported the war when we invaded in 2003, and have defended it since, pointing out that terrorists do not need weapons of mass destruction to cause a great deal of death and destruction. I've pointed out that Saddam Hussein had documented connections to terrorists, and that he was a national security threat. But, with five years of hindsight, was my position the right one to take? With five years of hindsight, would I have supported the war in early 2003? The answer to that question is "no". The most important question is whether we should engage in preemptive war against a country that is a threat, but has not directly attacked us. John Hostettler, one of the most conservative Republicans in Congress, voted against President Bush and his party's leadership on the war, stating on the house floor that "Iraq indeed poses a threat, but it does not pose an imminent threat that justifies a preemptive military strike at this time." Five years ago, Hostettler's speech raised doubts in my mind about the wisdom of the war, and I believe he was right all along. Another problem is the way the war was authorized in Congress. 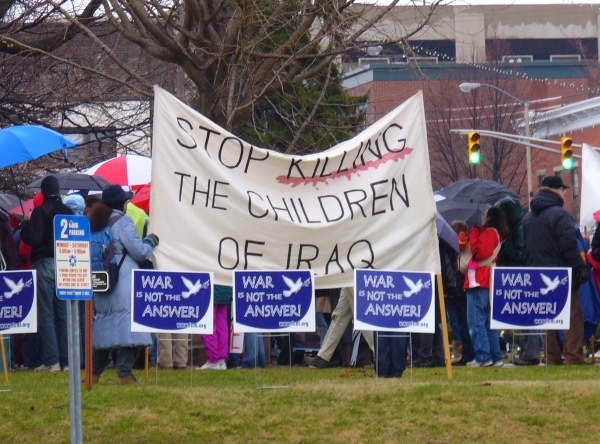 Instead of using its Constitutional authority to declare war on Iraq, Congress passed an "authorization to use force", voting for the war but also punting the final decision to President Bush. If we needed to invade Iraq, remove Saddam Hussein from power and replace him with a new government, Congress should have declared war, as we did against the Axis Powers in World War II. The Iraq War is another in a long line of military conflicts where Congress abdicated its responsibility to make a decision on going to war. This also increases the power of the Executive Branch relative to Congress, a source of concern. The question that can only be answered now is whether Iraq is better off now than it was before the invasion, and whether the United States is better off. The war has spread our military thin, and there is concern that it has taken needed resources away from the war in Afghanistan. Should another front open up in the war on terror, we will be hard pressed to fight it without a significant realignment in our forces or a reinstatement of the draft. I am not convinced that the Iraqi people are better off with the insurgency taking innocent lives and creating a volatile atmosphere. And while Saddam Hussein was certainly evil, was he irrational enough to aid a terrorist attack against the United States, especially in the wake of our invasion of Afghanistan? Whether it was a good idea to go or not, we are stuck in Iraq and now we have to deal with the problem. If we leave, will Iraq fall into civil war? Will it be in chaos for years, like Somalia or Afghanistan? Will removing American military power from the area give an increasingly aggressive Islamist regime in Iran an opportunity to expand its economic, political and military influence in the Middle East? Will Iraq be a breeding ground for terrorists to threaten Israel and Europe, in addition to the United States? Leaving Iraq may sound like a good idea, but unless we can do so with a plan that will ensure a secure and orderly transition after we are gone, we may well be forced to invade again a few years down the line.